Diamond and Oval Emerald Cluster Ring. 18k Gold. An emerald ring designed as an Illustrious Sparkling Emerald & Diamond Cluster Ring. 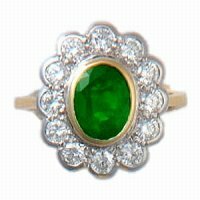 This Glorious Ring is composed of one Oval Cut Emerald set in an 18 carat Yellow Gold head in a Rub-Over setting, & is surrounded by 14 shimmering Brilliant Cut Diamonds, set in 18carat White Gold also in a rub-over setting. All set in an 18 carat Yellow Gold mount. The Emerald weighs approximately 1.60 carats & the Diamonds weigh approximately 1.02 carats in total. A Ring as traditional as this could never be outdated, only updated so fashion wise your set for life. 18k -750.